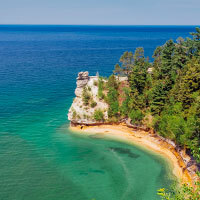 Experience the power and glory of the big five forever: Lakes Huron, Michigan, Superior, Erie and Ontario on Fantasy’s 27-day Great Lakes of North America tour, May 23 to June 18, 2019. Collectively, these greatest of lakes form the largest group of freshwater lakes in the world, 94,000 miles to be exact. A matchless life force in North America – food, energy, commerce, recreation, culture and even weather emanates from these mighty waters. Starting in Niagara Falls, Ontario, and ending in Chicago, this is your chance for the ultimate “once around” these liquid legends. It’s a grand trip around the Great Lakes that you shouldn’t miss! Fantasy’s signature orientation, welcome party and dinner in Niagara Falls (the honeymoon capital of the world) is a helpful and friendly prelude for the 3-day experience here. The adventure officially starts the second you don a souvenir rain poncho to see the falls from every perspective – land, water and air! On the Canadian side, we take the Journey Behind the Falls tour then get a little wet and wild on the classic Maid of the Mist boat tour. Lunch is 775 feet above the thundering falls in the Skylon Tower revolving dining room restaurant. Talk about breathtaking views! The grand finale is the thrilling Spanish Aero Car cable car ride over the Niagara Whirlpool. We spend a leisurely day cruising the Lake Erie Canal, connecting to the Hudson River, and stopping in Buffalo, New York. A city tour includes a stop at Anchor Bar, “home of the original chicken wings” and the top-secret sauce. Toronto, Canada’s largest city, is just a short drive away. During our 3-day stay, we’ll take a guided bus tour to St. Lawrence Market and Harbourfront in Toronto’s Old Town; and the city’s famous landmark, the CN Tower for sweeping views of Lake Ontario and the surrounding islands. Scenic views make us thirsty so we head to Steam Whistle Brewing for Toronto’s famed craft beer in green glass bottles, Steam Whistle Pilsner. Aboard the majestic schooner Kaloma we ogle the city’s striking skyline from the water. Last stop today is Casa Loma, Toronto’s Edwardian castle. Think “Downton Abbey” full of period furniture, secret tunnels, and views of the lush countryside. A relaxing overnight in Sudbury, features a campground cookout courtesy of your Fantasy Ambassadors. Then, we cross into the United States for 3 nights in Sault St. Marie, Michigan, the “place where Michigan was born.” Highlights here include a dinner cruise through the famous Soo Locks along the Ontario and Michigan shorelines. A living history lesson springs to life as we visit the Tower of History, 21 stories of peaceful countryside views; and Ermatinger-Clergue National Historic Site, depicting the lifestyle of local entrepreneur Charles Oakes Ermatinger. On our last day here, we explore the Gros Cap Conservation Area from the high cliffs overlooking Lake Superior’s shipping lanes. Another short drive to the cozy waterfront village of St. Ignace on the Petoskey stone-pebbled shores of Lakes Huron and Michigan, home base for an exploration of Mackinac Island and its 19th century ambiance. No cars allowed, but a carriage tour of Mackinac Island Park is a wonderful prelude to lunch at the luxurious Grand Hotel, overlooking the straits of Mackinac. Afterwards, we’re treated to a 1780s cannon salute at Fort Mackinac. Back in St. Ignace we stroll along the Lake Huron boardwalk, viewing the “Mighty Mac” bridge, the longest suspension bridge in the western hemisphere. Onward and upward through the rugged beauty of the Upper Peninsula, “UP” to Munising. Fantasy’s fabulous Ambassador top chefs are grilling again tonight. We cruise Pictured Rocks National Lakeshore enjoying the many natural and manmade wonders along the Lake Superior coastline. In Houghton, we visit both the Mineral Museum of Michigan and Quincy Mine in Kenewaw National Park. A cog rail tram provides a bird’s eye view of the unique Portage Lake Lift Bridge. Two nights in delightful Escanaba include a tour of the painstakingly restored Sand Point Lighthouse that has guided seafarers to safety since 1989. We turn south to Packertown aka Green Bay, Wisconsin for two exciting days. We’ll see a performance downtown at the famous Meyer Theater. We’re treated to a tour and lunch on the hallowed grounds of Lambeau Field, home of the Packers and then all aboard a vintage train for a tour of the National Railroad Museum. Wisconsin’s largest city, Milwaukee, is all about beer, and a beer-tasting tour and lunch is the first order of business here. Next is a blue ribbon tour of the Pabst Mansion, once home to beer baron Captain Frederick Pabst. Then we go hog wild at the Harley Davidson Museum! 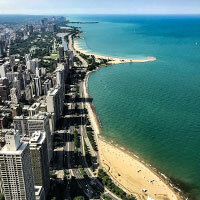 Wind down in the windy city of Chicago – yes, it’s definitely your kind of town. We’ll wriggle into Wrigley Field, the official den of the Cubs. We’ll also soak in the 360-degree views from the 360 Chicago Observation deck 1,000 feet above the “Magnificent Mile.” But it ain’t over till we’ve splurged on Chicago’s famous deep dish pizza pie for lunch. Chicago is called “America’s best architectural city” and you’ll see it from Lake Michigan on a farewell dinner cruise. We’ve had a great time on Fantasy’s grand Great Lakes tour! There are two Great Lakes tours scheduled in 2019, departing May 23 and May 30. In 2020, tours depart on May 21 (which is exclusively an FMCA tour) and again on May 28. Spaces are filling quickly!